We didn’t move yesterday. 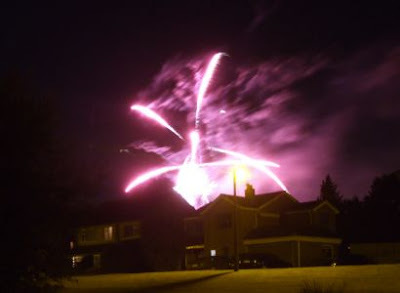 It looked like everyone else in the county was! Boats of all shapes and sizes toddling past, especially when the weather brightened in the afternoon. Then in the evening we were treated to a firework display from just over the rooftops on the opposite side of the river. This morning we had a bit of a lie-in, then moved the 100 yards over to the services for the usual emptying and filling. 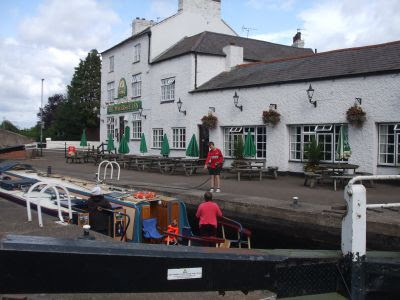 We pulled a bit closer to the deep lock, and I made a quick trip up to the Sumerfield in the village. It was a Co-op when we were here last, but they’ve merged since. 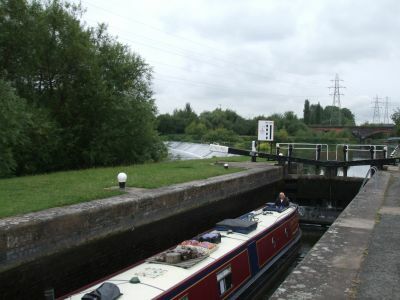 Then it was a matter of joining the queue for the lock. It’s always slow, this lock. It takes a lot of water to fill a broad lock over 10 feet deep. But it was especially slow today. Both upstream ground paddles were out of action, leaving only the gate sluices operational. To fill the lock took 25 minutes, and by the time we got in there were 8 boats waiting behind us. Still, once in we were down and out of the bottom gates in 5 minutes. Sharing in Barrow Deep Lock. NB Pickles No2 is knocking about somewhere. 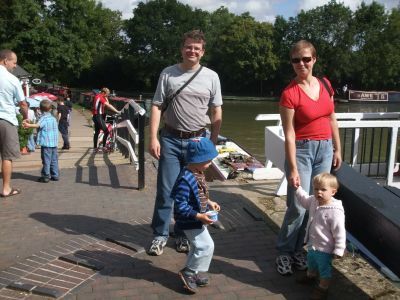 Pete said Hi at the lockside, but I didn’t see his boat or Lisa, his wife. I’m sure we’ll catch up over the next week or so. It’s a very pleasant wooded stretch from here to Pillings Flood Lock and the canal section into Loughborough. Pillings Lock is open now the water has gone back down. 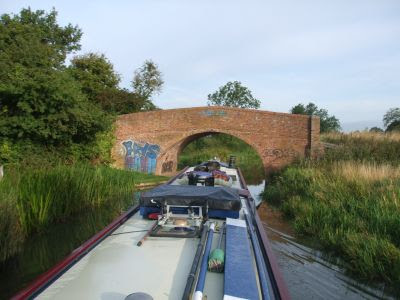 We pulled over near Millers Bridge south of Loughborough. 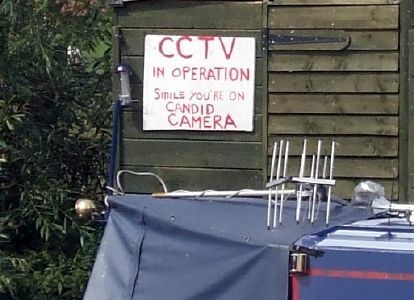 There’s a boat on the other end, honest. I’ve got some phone calls to make tomorrow. 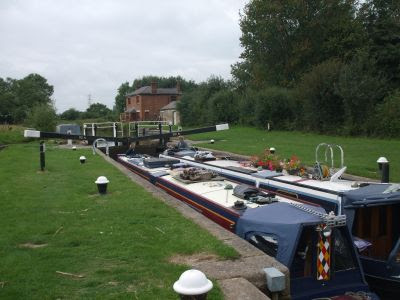 Pillings Lock Marina to see if they’ve room for us for a week or so, and then Enterprise to book a car for the weekend. With the weather improving and the rain easing, the river levels have dropped to somewhere approaching normality. 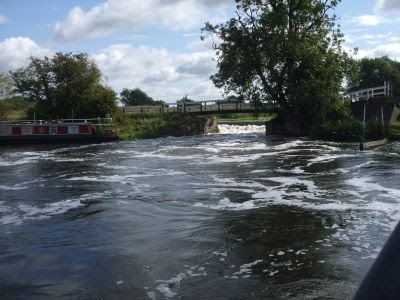 We dropped down Sileby Lock yesterday morning, the weirs were still flowing strongly, but we didn’t need to stop at the Mill, so just gently motored around the corner. Low revs were enough to maintain steering. Sileby Mill Weirs The river was still running at maybe 3 mph, so we didn’t get much above idle all trip, just a burst of throttle required to push the stern around some of the tight turns. 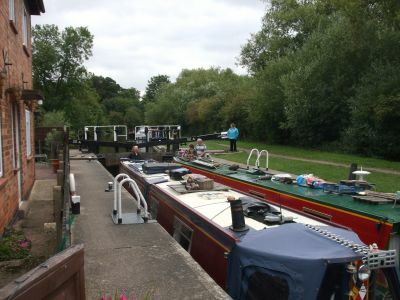 We arrived at Mountsorrel Lock as a boat was leaving the moorings above, so shared this one, and were able to leave the gates open for boats coming upstream. Mountsorrel Lock, The Waterside outside seating unusually empty. I bet that changed later. A couple of miles saw us arrive at Barrow, and we snuck onto a bit of mooring just next to the large weir. 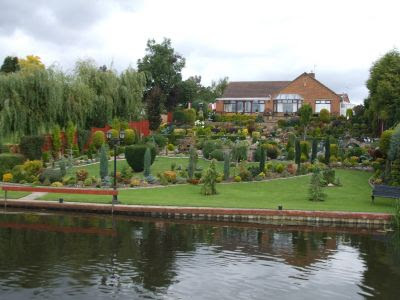 There are some beautiful gardens running down to the river’s edge from properties on Sileby Road. 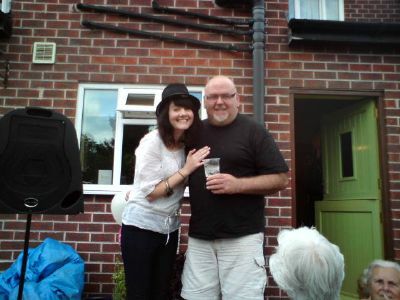 We got here about noon, and were collected by Dad to go to a BBQ at my sister’s, Kay’s, home in Loughborough. The celebration was by way of a congratulations and leaving do for my neice and God-daughter Samantha, and Kay’s partner’s daughter, Eden. They’ve both done well with their exam results and are off to University in September. Well done, girls. The weather was kind, only a light shower marred the afternoon, and a good time was had by all. We’ll be hanging around here for a few days now. 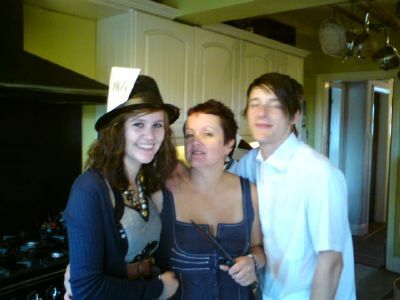 Catching up with the family and I’ve got a 10k up in Sheffield on the 5th, so we’ll be getting a car to go up there. Here’s a it of Bank Holiday madness. Stuck in a sandbank?? Wednesday afternoon it rained. Wednesday night it rained. Thursday morning it rained. Thursday afternoon it rained….. 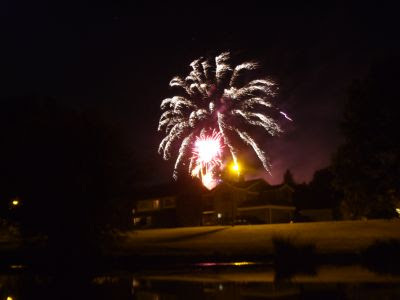 It finally slowed to a drizzle on Thursday evening, then petered out later on. Where we were moored the river came up about 18”, peaking around mid afternoon yesterday before starting to slowly drop back. This morning it was still in the red zone on the level markers, but heading down towards the amber, so we decided to get going. We were joined by a pleasant couple, Jack and Lou and their fine looking boat NB Evelyn May. 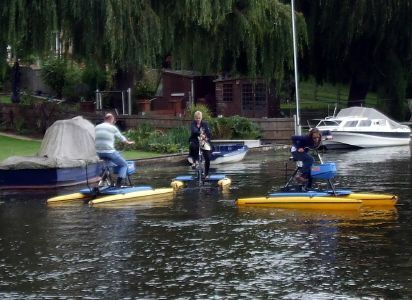 They’d arrived yesterday afternoon, after an interesting trip down from Belgrave Lock. 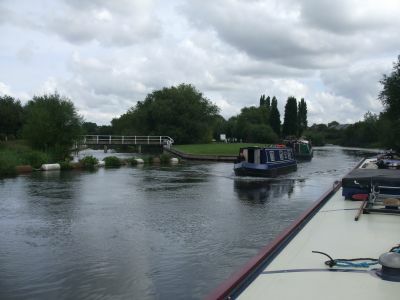 There had already been a couple of boats on the move, and we met another one as we arrived at Thurmaston Lock. The waterway is well overhung with trees, requiring a bit of slalom to avoid getting the roof cleared…. At Johnson’s Bridge the river shoots off to the left over a weir, leaving the navigable channel fairly still all the way to Wreake Junction, where the Wreake joins in. Junction Lock drops back down onto the river level again, although it doesn’t actually rejoin till just above Cossington Lock, a mile further on. 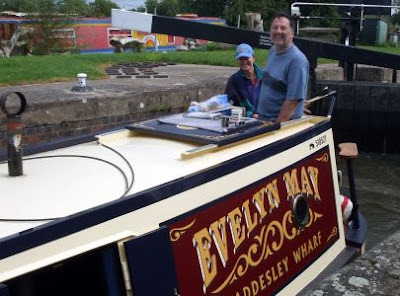 We were joined in Junction Lock by a small plastic cruiser. We had a bit of a hold up leaving, as he couldn’t get his outboard going, but he got it sorted out in the end. 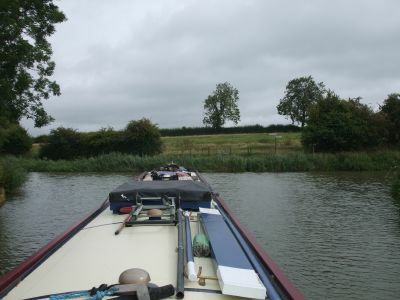 He turned around to head back before Cossington; perhaps as well, below the lock the river got quite fast in the narrower sections. 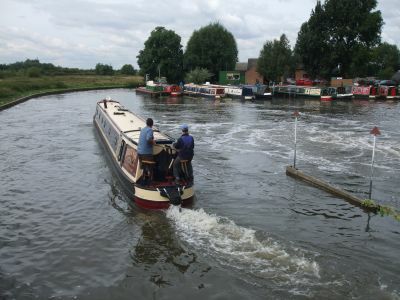 We’d planned to pull in above Sileby Lock, but Jack and Lou decided to push on a bit further, they needed to fuel up and get a pump out, and Sileby Mill Boatyard below the lock is handy. 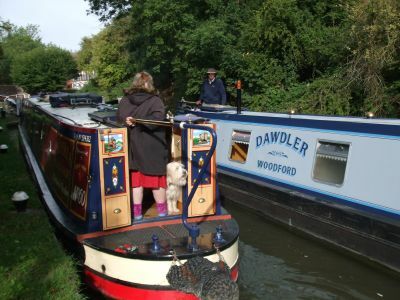 I helped them down the lock, then they set off across the weir stream to get onto the fuel pontoon. They actually made it a look easier than I expected, not trying to go straight across, but passing the pontoon then reversing in the slacker water on the right. Filled and emptied, they pushed off towards Barrow. Have a good trip guys. Nice to have met you. We’re staying put tonight, then heading down to Barrow tomorrow. Even though the levels on the river are still just in the red, there have been quite a few boats on the move, both up and down. It’s dropping again now, after reaching a bit of an equilibrium earlier. 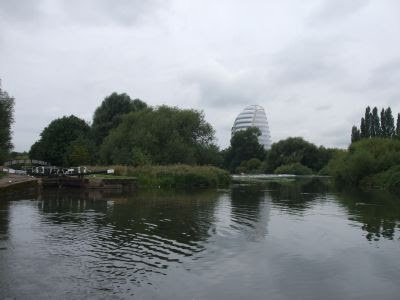 The owners of boats at the Ash Tree Boat Club are counting the cost of an attack by burglars on Tuesday night. Though why it's called "a daring raid" I don't know. Daring implies to me something courageous and honourable, risking life. Not a break and entry by a gang of scroats. Last evening’s showers cleared to give us a fine night as predicted. 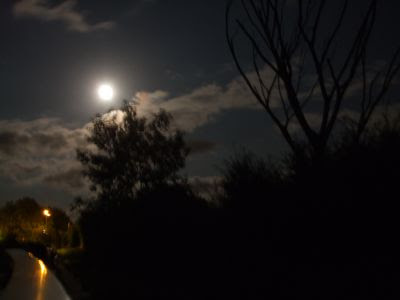 The full moon was very bright. Our early start today was just after 7 AM. Even so, we were beaten to it by another boat leaving the moorings at 06:15! Unfortunately this meant that the first few locks were all against us, till we started meeting boats coming up. It’s been a pretty uneventful day, steady locking down from the countryside around Kilby, through the dormitory areas of Wigston, then back out into green stuff near Aylestone before coming into the city proper. Indicators of the imminent approach of built-up areas. 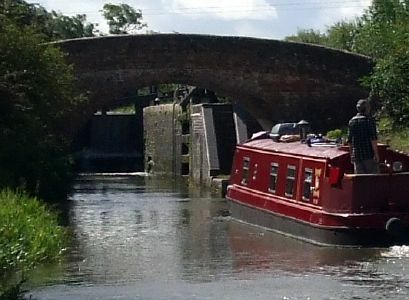 Kings Lock. This is about half-way, and we’ve stopped here before to break up the trip. It’s quiet and out of the way, although only a short distance from Aylestone. There are lots of footpaths around Aylestone Meadows. Today though we’d decided to push on, down onto the river below the lock. Aylestone Globe sculpture at Aylestone Mills Lock. The ground paddle pedestals need some TLC…. The character of the waterway doesn’t really change till you get to Freemans Meadow. 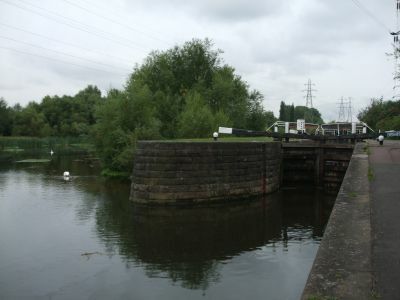 Here the lock is deep, alongside a large weir, and the river is wide below. Leaving the lock, you suddenly get a reminder you’re on a river. Downstream from Freemans Meadow we’re back on an artificial cut, taking a dead straight line almost due North through the city. The “mile straight”, actually only eight tenths of a mile long, ends with a kink to the left at the ornate West Bridge. Oh, this does annoy me! We still use MPH on the roads, for God’s sake! 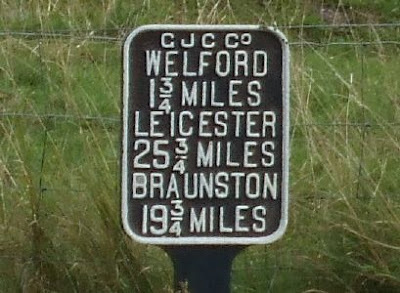 And if they must use “continental” speed limits, why go to 2 decimal places? 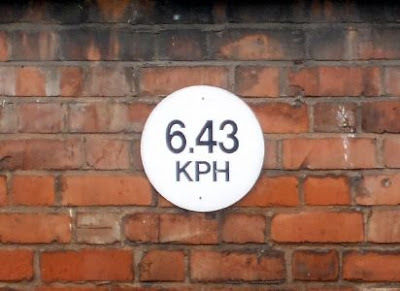 How accurately do they think we can measure narrowboat speed? 6 or 6½ would be more acceptable. The run through from Kilby Bridge is actually quite pleasant. 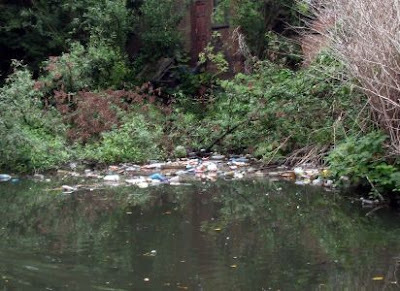 The river sections are clean, but the section of canal around North and Limekiln Locks spoils the trip. Lots of rubbish collects against overhanging tree branches. The cut is left again for the river at Belgrave Lock. In the background is Leicester’s own “Gherkin”, the National Space Centre. A gentle couple of miles through the meanders leads to Birstall, and our last lock of the day. 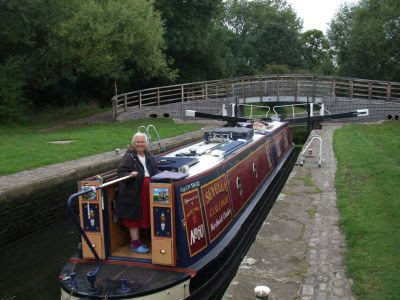 Birstall Lock, Mags looks happy. We did what we wanted, beating the rain. We arrived at 13:40, after 6½ hours, the rain arrived just before 15:00. After yesterday’s evening showers the sky cleared and it was a fine night, dawning to give us beautiful blue skies. It wasn’t to last, though. Clouds started rolling in soon after we got off, driven by a strong wind from the west. Where we moored last night we had wide views across the open parkland that was the site of the medieval village of Wistowe. 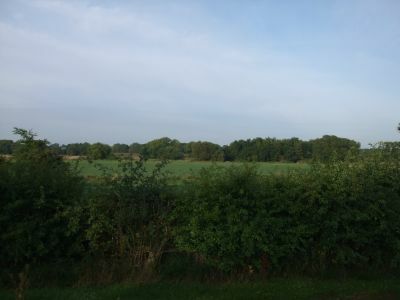 Looking out over the village site. The 13C St. Wistans church is just visible to the left. I’ve tried without success to find out why it was abandoned, it seemed to be in an excellent location, fertile grazing, woodland for fuel and construction materials, a growing city nearby for trade. A clue could be that there’s a large hall here, and it was not unknown for wealthy landowners to move whole communities in order to create private parks. This happened at Shugborough in Staffordshire. 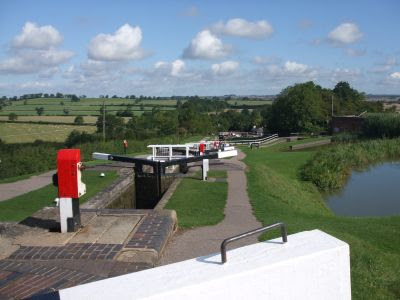 Today we’ve had a regular run of locks to descend, the first after about 10 minutes, then the rest no more than 15 minutes apart. 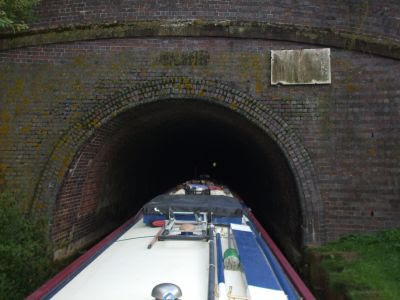 I though we were going to be in for a bit of frustration, as we arrived the first couple of locks were against us, with the lower gates stood open. Then after closing them, filling the lock, dropping down and Mags motoring out, I found that I couldn’t keep the bottom gates shut either! I closed the one that we’d come out of, only to have the other one swing open. Crossing over the top gates, I closed the other one, crossed back and the damn thing swung open again. I’m afraid that’s how it stayed. I know you’re supposed to close everything on leaving, but there are limits on how many times I’m prepared to walk around a lock! 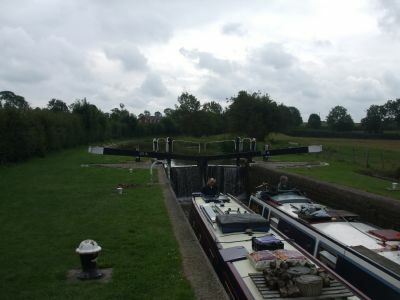 By the time we’d got three locks under our belts traffic that had spent the night at Kilby Bridge had started to arrive, so the locks were filled ready for us, and we were able to leave gates open with a clear conscience with boats approaching. Between Locks 26 and 27, Bottom Half Mile Lock and Turnover Lock. The clouds roll in! Another customer for Bumblebee Lock. I thought we might get away with the weather, but 10 minutes from Kilby Bridge we had a heavy shower. It didn’t last long, and with the brisk wind everything had dried out again by the time we pulled onto the services at the BW maintenance yard. 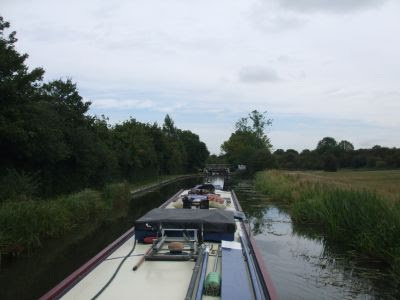 We filled with water, emptied a loo and rubbish, and motored across the canal to the moorings. We’re staying here tonight, taking it easy, girding our loins ready for the run through Leicester tomorrow. The forecast is for rain later in the afternoon. We’ll be making an early start, hoping to avoid most of it. We had to pay for having such a pleasant day yesterday, didn’t we. Heavy overnight rain left big puddles on the towpath, but at least they’d cleared by the morning. Still grey though, with more forecast. We were on the move around 10 as usual. 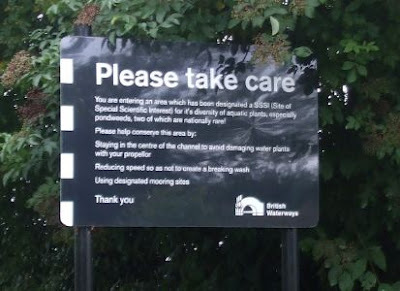 There’s a designated SSSI along the canal, starting just past Debdale Wharf Marina. It runs all the way to Kilby Bridge. Exceptionally rare pondweed, indeed! 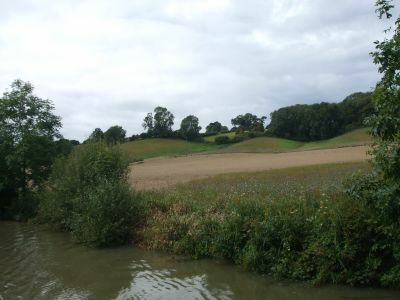 The canal does a few switchback turns, following the contour of the land, before arriving at Saddington Tunnel. 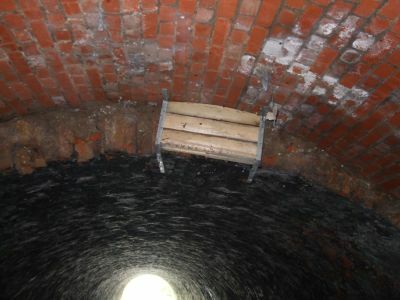 This tunnel is known as home to a colony of Daubenton’s bats, although none were in evidence today. They hibernate for 6 months a year. Not a bad idea, with our current climate! We did see a kingfisher ducking in and out of the entrance, maybe taking spiders from the cobwebs just inside. Bat box about 100 feet in. 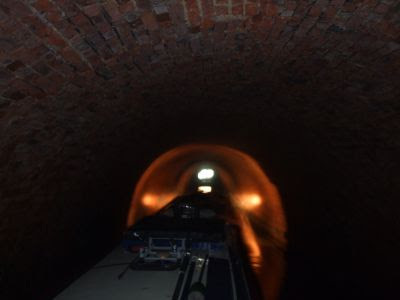 The red brick lining throws back an eerie light from our flat beamed tunnel light. The light is actually a fog lamp from a 60’s Riley 1.5. It’s flat beam is ideal for tunnels, clearly illuminating both walls without dazzling oncoming traffic. 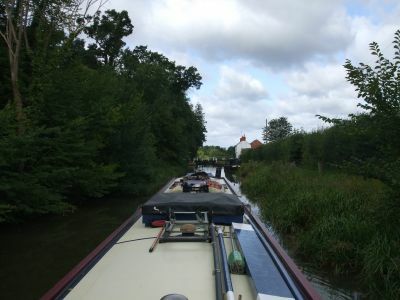 We pulled in just past Fleckney Bridge to make a quick visit for essentials at the Co-op in the village, then were passed by a boat as we were getting ready to move. 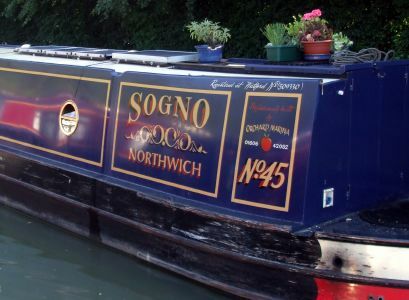 We caught up with them at Kibworth Top Lock, and shared the next five, down to Wistow. All the locks from here to the Trent are broad, now. In Kibworth Top Lock with NB Lazy Bee. A couple of years ago, in the winter, we arrived here, going up. The pound above was almost empty, and I had to run water down through the uphill locks so we could get going. No problem today, there’s water coming over the top gates. There was a boat waiting to come up. 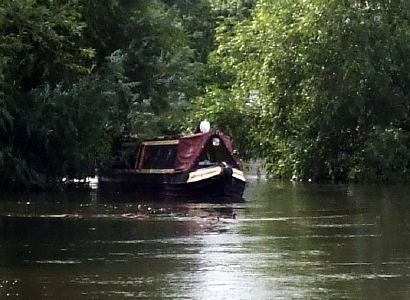 It was NB Blackden Gem, yet another Orchard boat, this time number 14. She’s the last one that Stan Collymore built from the base plate up, after this he bought shells in. She’s actually the 13th that he built, but you don’t put that on a boat, do you…. Still looking good, NB Blackden Gem. The weather took a turn for the worse, a short shower being the prelude to more continuous heavy rain. We only had to put up with about 15 minutes of it though, before pulling in as planned at Wistow. The couple on NB Lazy Bee went past, but I’ve a suspicion they might also have called it a day a little further on. Yesterday’s weather was decidedly grim, showers on and off for most of the day. So we stayed put, and I changed the oil and filters on the engine and gearbox. Today was much better, warm and sunny first thing when I was out for my run, so it was pull pins and head off down the locks as soon as I’d taken Meg out for her morning constitutional. NB Sogno arrived yesterday afternoon in a heavy shower, no sign of life this morning as we passed. This is another Orchard Marina boat, maybe 3 years older than Seyella. We were lucky to arrive at the top of the locks at the right time, able to start down straight away following a couple of boats already in the flight. Fine view of the Leicester plain from the top lock. Inevitably, it being a fine Sunday during the holiday season, there were lots of folk around. I reckon I explained the fundamentals of lock operation at least four times. I was helped with the gates by a family from Germany (I think), so I only had to work one side and we made rapid progress. Midway down, a short pound allows boats to pass. 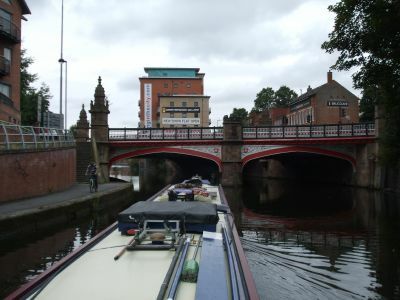 In either of the 5 lock staircases, once a boat is in the locks, another boat cannot pass in the opposite direction. 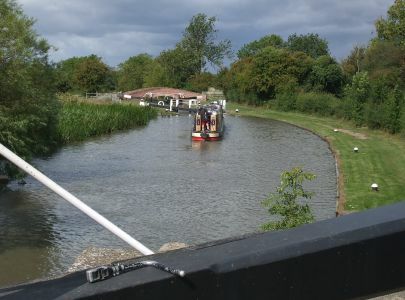 The operation is usually controlled by lock keepers during the season, and they allow 5 boats in each direction at a time. At the bottom, our helpers said cheerio. I’d bought the kids an ice cream tub each as payment. There were a few boats waiting to go up by now, including the hotel pair Snipe and Taurus. They’d just collected a party of guests in Market Harborough and were off onto the summit level. 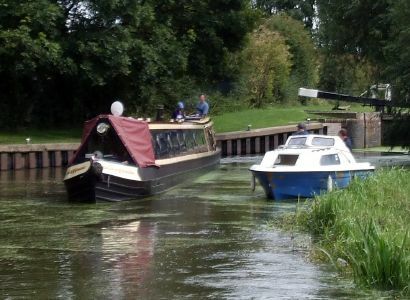 Snipe and Taurus manoeuvring for the bottom lock. We filled and emptied as required at the new swing bridge, then turned around and headed out of the bustle surrounding the junction. It’s always a bit chaotic here during the boating season. 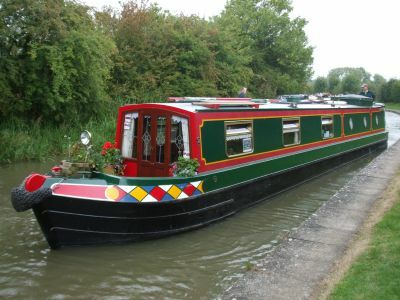 Hire boats based at Union Wharf in Market Harborough are arriving on the main line, either to go left up the locks or right towards Leicester. Then there are the boats already on the main line, as well as a couple of Foxton Boat Services day boats and the trip boat MV Vagabond. 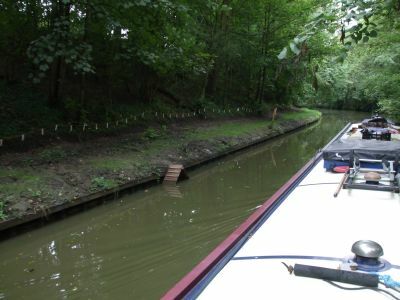 All of the 48 hour moorings were occupied, but we found a bit of bank space just past the footbridge. Two more easy days to Kilby Bridge, then the run through Leicester. 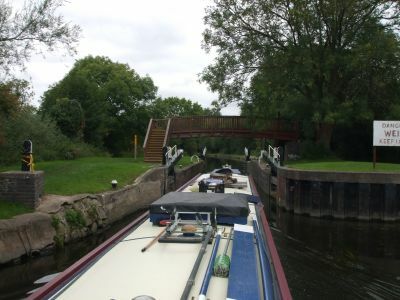 We usually stop at Kings Lock near Aylestone to break the journey, but may decide to push straight through in one go this time. Had a civilised start again today, off at around 10 o’clock. 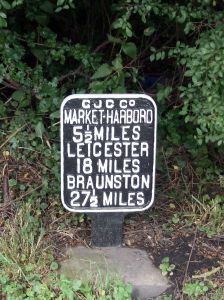 Just around the corner is the county boundary, so we’re now in Leicestershire. The rolling landscape still looks the same, though. 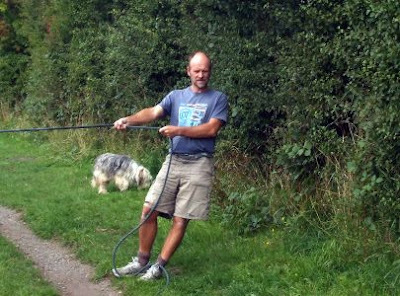 The Welford Arm comes in near here, a navigable feeder bringing water in from two reservoirs above the town. Reclaimed from dereliction in 1969, it runs up to a small basin and marina, through a shallow lock. We needed diesel and gas, and so intended to pull in at North Kilworth Wharf, just about a mile from the junction. 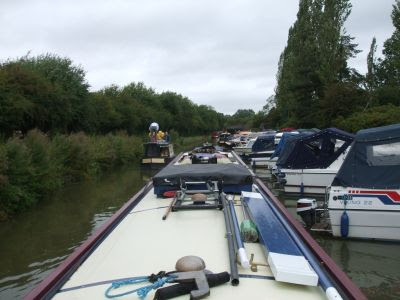 A boat came out from Welford just ahead of us, and they beat us to the wharf, pulling in for fuel and a loo pump-out. We dropped onto one of the pontoons used for permanent moorings for the 45 minute wait. These last two fills we’ve used about 8% more fuel per hour than our usual consumption. I think it’s because we’ve been on the rivers Severn and Avon, at least I hope so. I’ll know better next time. The short bits of the Soar are not going to make a lot of difference. 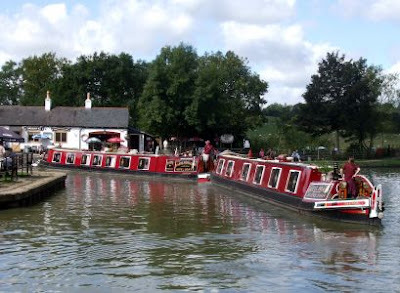 We got away again and had a gentle cruise to the top of Foxton Locks. From Welford the canal is wider and deeper, probably more boats use this bit. BW have recently done some bank repair work in the cutting towards Husbands Bosworth Tunnel. Towpath repairs. They even included several duck ramps! A softer, more environmentally friendly (and probably significantly cheaper) method has been used instead of sheet steel piling. 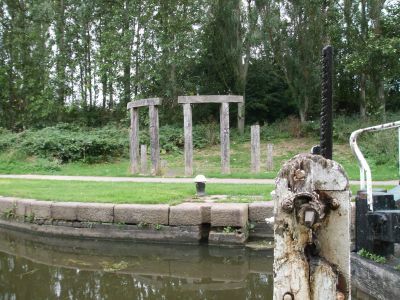 A flexible membrane is supported by timber posts forced into the canal bed, then the space behind backfilled with silt dredged from the canal. A wooden rail along the front of the posts holds the whole thing together till the silt consolidates. 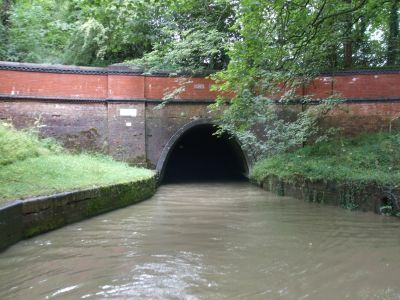 Husbands Bosworth Tunnel is shorter than the previous two, at 1166 yards. It’s wide, high and drier than Chirk. We met one boat coming the other way, passing without incident. A lot of the villages around here seem to have double-barreled names. Husbands Bosworth, Market Harborough, Smeeton Westerby (I love that one) and Kibworth Beauchamp. There must be some historical significance. There’s been a brisk breeze today, but it’s not affected us very much, with high hedges or cuttings deflecting the wind. But it did bring heavy, rain-filled clouds over, one of which dumped on us for half an hour. But the warm wind soon dried things off afterwards. 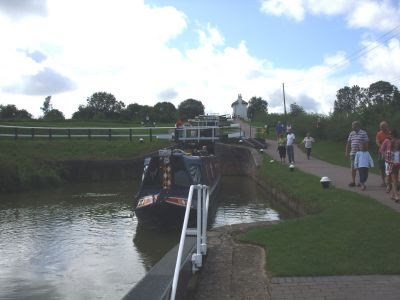 We arrived at the top of Foxton Locks at around 2, mooring just before Gumley Road Bridge. It’s quieter here, off the tourist route around the locks and inclined plane. This is the end of the 20½ mile long summit level. From here it’s a steady fall all the way to the Trent. Old boats by the fist full. Two locks, Two towns, Two trips to Tesco. Off the river, onto the canal.